I got really excited when walking down the health aisle at our local supermarket. You see, they had sugar free digestive biscuits. I have never even tasted a ‘normal’ one before but I knew that I wanted to make a cheese cake using them as soon as I saw these. In South Africa we have a lovely coconut flavoured biscuit (cookie for my American readers) that we would usually use for a base for cheese cakes. I obviously cannot use that and so I often make my own biscuits to make the base. Now, here was a ready made biscuit for me to try. And surprisingly (to me) they are a really tasty biscuit. I can really see myself getting stuck into eating them in one sitting if left to my own devices! I was given a recipe card from my mom for a Kiri raspberry and white chocolate tart and used that as inspiration for my recipe. Kiri cheese is a childhood favourite of mine and there is always a box of the small cream cheese blocks in my fridge at work. I am not sure if this cheese is available world wide and so I used a standard cream cheese to make this recipe for a milk chocolate cream cheese tart, to ensure that it can be replicated no matter where you live. The cream cheese ensures that the milk chocolate is not too sweet – perfect for me! I wish I could get some sugar free white chocolate! 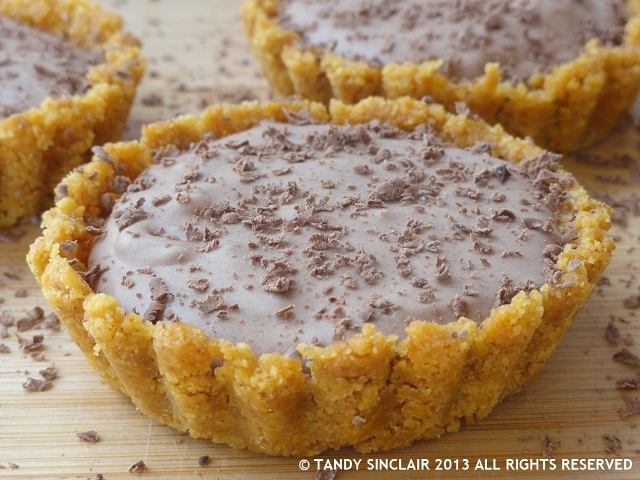 This tarts look great Tandy, the chocolate filling sounds and looks very light and fluffy…love it! Yum! How sweet and delicious looking! Gosh those are so pretty! Cream cheese is one of my secret weapons. I love the velvety smoothness that it adds to dishes. I thought you would enjoy this recipe!